I read this book in one night. I was captivated by the story and strength and resilience of this young woman who, in middle school, began selling drugs to better her life. As I was a toddler when the narrative began, I personally cannot remember this time in American history. This book shed light on the Reagan years, and the advent of cocaine in America. Portions of the book made me cry. The narrative is so heart-wrenching, you want to reach through the pages and hold this young girl, you want to step in for her absent parents. You keep turning the pages because you want to see how it all turns out. What I really found lacking was more information on how the author is doing today. There was brief information at the end, but I would have found more information about her life in the intervening 25 years from her teenage years to publication equally as fascinating. After that review, the author tracked me down to thank me. And we’ve been exchanging email on occasion ever since. I’ve been fascinated with her writing process. What it takes to write about something so personal, so deep and emotional. And to put it all out there. You can tell by some of the idiotic reviews on Amazon (and especially Goodreads) that some of the people reviewing did not read the same book that I did. Yes, everyone is entitled to their own opinion, but instead of critiquing the book for its literary merit, they ended up critiquing the author for her personal choices she made as a teenager 30 years ago. I recently asked Ms. Sena if she would do an interview about this subject, and she graciously acquiesced. 1) Where did you get the idea for your memoir? Was it something you always wanted to do after the events took place? Or did you have a dream or a stroke of divine inspiration? I planned to write my memoir for nearly twenty years. I was twenty years old and reflecting back on all the events of my teen years and I realized that the story had all the components of fiction. It was kind of startling to see life so perfectly imitating art. I started telling people then that one day I would write this book. When I finally sat down to write it twenty years later it became clear that I needed the perspective of lots of time and distance from the events to write something like this. 2) How did you decide which years to focus on? I knew exactly where the book would end but I wasn’t quite sure how early I should start it. My first draft had an additional five chapters in the beginning that described my life when I was 13 and 14 years old. But my editor and I ended up agreeing that the clearest beginning was the day I met Armando. So my original chapter 6 became chapter 1. 3) How did you remember events and timelines? Did you have journals from those time periods of your life? Court records? Did you interview family members? I have an overactive memory. It can be frustrating sometimes but in general it’s very helpful. I memorize everything in chronological order in my life. I can tell you what house I lived in by what age I was. I also memorize conversations, especially significant ones. Sometimes I watch a movie I haven’t seen in many years and I find I have memorized the majority of the dialogue. I memorize things that are significant to me, and I can often remember where I was, how old I was, and what I was wearing. I do have court records. I never looked at them but I gave them to the lawyers who vetted my book and they were able to view the actual charges from the court. There really are no family members to interview except for Joan who doesn’t really remember anything. Although I don’t keep journals I am an avid poetry writer. I’ve written thousands of poems and I did take the notebooks from those years and reread all the poems I had written. They are confessional but they didn’t tell me anything I didn’t already remember but they helped with my voice since I don’t always memorize my side of the conversation precisely. 4) Did you write chronologically, or as memories came to you? Did you have a timeline? Lists of events you wanted to cover? Is there some fantastic, unabridged version of “Closet” out there? If so, can I get a copy? I’m sorry there is no real unabridged version. I started by creating an outline and a timeline and a character sheet. Then I went through in the outline and I made a list of scenes that would take place in each chapter. I wrote chronologically but sometimes I would remember something that was going to happen a few chapters ahead and I would jump forward and place that writing into the appropriate spot. 5) Have any of the people featured in the book read it? If so, what were their reaction to their portrayal? None of the surviving members of my family have read it to my knowledge. 6) Have your current friends read it who didn’t know about your past? Was it difficult for them? Many of my friends had a hard time with the book. Many people were surprised that they’ve known me decades and they didn’t know the contents of the book although they knew the generalities. There were few people who felt like they couldn’t finish it because it was too disturbing. But part of that is the fact that my current friends are not the type of people that enjoy horror or scary stories like mine. 7) Was it difficult for you writing certain scenes? I knew every scene I was going to write in advance and I really had no problem with any except the entire chapter about my sister. I saved that until last. I dreaded writing it because I really didn’t want to remember the details. 8) Your memoir is excellent at inserting the reader directly into a scene. I was born in 1982, but I swear I could hear the music, feel the lace gloves. Personally, I can barely remember what song was popular, what I wore, the atmosphere of a given day in 1998 (when I was 16), did you have to do research, or did it come from your memory? All the music and the outfits came from memory. I was able to grab a small photo album I have with a couple dozen pictures that reminded me of some of my more favorite outfits and I was able to write them into the book. I do seem to be wearing lace gloves in practically every photo! The music I remembered perfectly but I also have memorized thousands of songs. I could hear the music playing in my head. Still, I went to YouTube and watched the videos I spoke about from MTV, I reread the lyrics and listened to all the songs that I mentioned mostly just to bring back memories. 9) This is a very emotional, personal, heart-wrenching story. How difficult was it for you to put that much of your soul out there for the perusal of humanity? I followed the advice of my idol Erica Jong. She says she writes every book telling herself she will not publish it. I did a similar thing where I told myself I would cut out anything I couldn’t handle, or that made me uncomfortable. She also said that whatever you don’t want anyone to know, that’s what you write about, so I did. I cannot explain what gave me the courage to then publish it. I have read the book myself hundreds of times since then and I cringe during some of the passages not believing I had the nerve to leave it in. But eventually I just accepted that what makes the book good is revealing all those secrets. 10) In some of the more traumatic passages, especially with the issue of sexual assault, your voice becomes more distant, more matter of fact. That is very in line with how trauma survivors view the events they endured, as if it weren’t happening to them, but to someone else. This lends incredible authenticity to your memoir. Was this on purpose or was this how it just came out? That was not on purpose and I am not aware of as being different from the rest of the book. The book lacks exposition leaves a lot of room for readers to think and feel on their own. It gives the intimate details of the events but it doesn’t go much beyond that. 11) Now that it has been out there for awhile, are you glad that you published? Would you change anything about the process? Yes I’m very glad I published it and I don’t think I would change anything that I’ve done so far. I’m very happy I self-published and retained editorial control over my work. One day I would like to publish a memoir of my experiences. If you are interested in reading about some of that drama, email me and I may provide you with a link to my page that has content pertaining to my book idea. Memoir fascinates me. It takes a tremendous amount of courage to put your soul on paper for the world to see. Closet Full of Coke is a tremendous study is strength, in resiliency. An excellent read and I highly recommend it to anyone who enjoys a good read. I’m hideous at telling jokes. My husband is the joke master. I really don’t have an entire collection of humor books. I mainly view my humor through raunchy stand up. Laughter truly is magical and I try to laugh every day. Some of the books I have mentioned already fit under the humor category. The “Mercury” series by Robert Kroese comes to mind. Another I found on bookbloggers, “There Goes the Galaxy” by Jenn Thorson, is a little bit of sci-fi, little bit of “Hitchhikers” and hilarious. I have three collections of “Calvin and Hobbes” comics by Bill Watterson. When I started reading as a child, I started reading the newspaper, just like my parents. And my mom’s favorite comic was Calvin and Hobbes, because Calvin reminded her of my brother. Now you have a picture of what my childhood was like. Some of the jokes I didn’t get until I reread them in adulthood. But now as I reread them, I see my daughter in Calvin. Karma made a mistake. I have one lone humor book in my collection. Mr. George Carlin. Napalm and Silly Putty. I like this particular book and I reread it often because it makes me laugh. Over and over and over again. I was raised Catholic, so I laugh even harder at times. Dogma is one of my favorite movies, I was on the floor when I saw that Kevin Smith cast George Carlin as the bishop. On. the. floor. I tried to watch it with an evangelical Christian one time. I don’t think we made it 15 minutes in to the movie when he made me turn it off. The book on this page belongs to my husband. The story behind it goes something like this: my husband belongs to a large Italian-Catholic family. When he was 10, he received that particular book as a gift because his family knew that he liked comedy and telling jokes. They apparently didn’t look inside. The table of contents lists: Dead Baby jokes, Helen Keller jokes, Polish jokes, Italian jokes, Male anatomy jokes, Female anatomy jokes, Herpes, Leper, so on and so forth. My husband was just delighted and went right to work on his act for the family talent show. So there is this 10 year old standing up in front of his wholesome Catholic family in the late 80s, spewing out “Truly Tasteless Jokes” by Blanche Knott. You probably could have heard a pin drop. And when they asked him where he heard such filth, he pointed to the guilty party who bought him the book. I hope that someone got it on film. Its October. Spooky time. I don’t do a lot of the horror show. Other than zombies, I don’t do the rest of the genre. No vampires, no werewolves, no chainsaws, no hockey masks. I’ll do an occasional serial killer book or series, but not too much of it. And I’ll do an occasional ghost story. But that’s my limit. I’m talking about a different kind of haunting. Books that stay with you long after you have turned the last page (or in my case, pressed the button). Either the character, plot, writing or all three just stay in your brain and resurface now and again to remind you about this book you read at one time. I have a few of these. Funny, as I read my first paragraph, these first two are of the ones I seldom do. The Lovely Bones — Alice Sebold — this violated my self imposed rules. 1) murder 2) sexual assault 3) involving a child. I have those rules in place for a reason, but one night I was staying at my parent’s house and couldn’t sleep and was looking for fresh reading material. And boy did I find it. I read the entire book in one night. And this was before the movie was even in production. I was literally crying my eyes out in bed as I was turning the pages. The way it was written from Susie’s point of view, how she tried to communicate with her family, I literally hurt for Susie and her story. A novel has never made me feel such deep emotion before. I had become a mother the year before, perhaps that is what it was, but since that time I have held fast to rule #3. I still want to cry just thinking about it. The Millennium Trilogy aka The Girl with the Dragon Tattoo — Stieg Larsson — this one violated the sexual assault and serial killer rule. But the character of Lisbeth Salander drew me in. Her fierce independence, the way her mind works, her stubbornness, but she does have a tender side. The way she sought her own brand of justice to avenge her own sexual assault made up for violating my own “no sexual assault” rule. I also enjoyed the relationship between Lisbeth and Mikael. I did see the movie, and although I did not like how some changes were made to the plot, I can see why they needed to be made. And casting Daniel Craig as Mikael definitely helped as well. And I am now a huge fan of Rooney Mara. And it helps that she comes from NFL royalty. 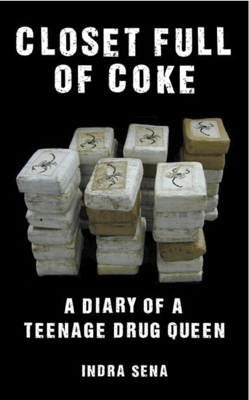 Closet Full of Coke: A Diary of a Teenage Drug Queen — Indra Sena — I love my memoirs. Being that I was born under the Reagan administration, I was not aware of the high flying partying in the 80s. And just look at the title!! Who can pass that one up!! But it wasn’t the descriptions of the partying and the money that haunts me. It is how alone in the world that this young girl is. And she feels responsible for her younger sister. Her parents are a mess and basically put her out to fend for herself, and so she does. I truly felt for her, even if I wanted to go back in time and smack her around for making stupid choices. Also what sticks with me is how this could have happened in America. I guess I’m naive. There are teenagers in this country that are going through this type of thing right now. Not everyone was blessed with two parents that wanted them, stayed together to raise them and always had the best interest of their children at heart. A wake up call for me, really. Very haunting. Outbreak — Robin Cook — An oldie but goodie. This is one of the first “adult” books that I read. No not “adult” in that sense (see my post on THOSE books here). This was the first time I read about things like the CDC, virology, epidemiology, all of those types of things. And I still think about them. 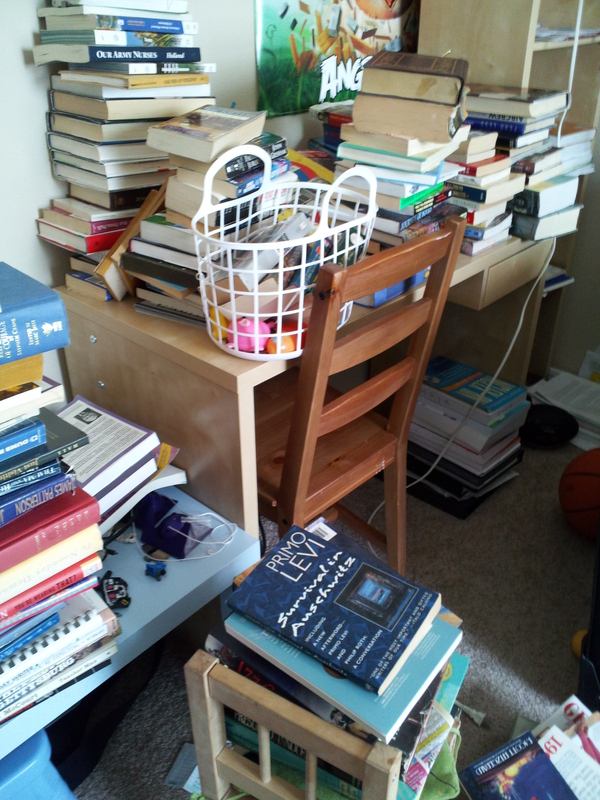 Obviously, since I love my post-apocalypse books so much. And currently there is a news story on about the current fungal meningitis epidemic. Haunting. On that note…Happy Haunting!! BOO! !